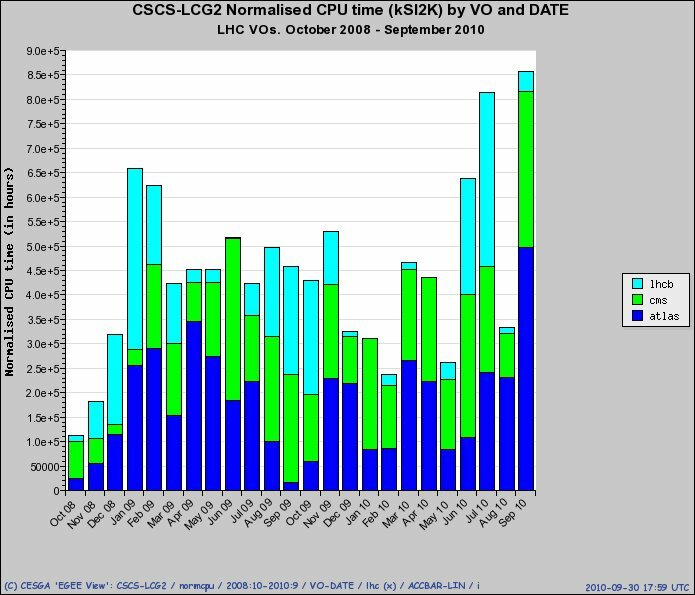 After upgrading to Phase C and making several improvements during the last months, September 2010 surpassed all Phoenix GRID Cluster records running around 200.000 jobs and computing more than 850.000 CPU hours (normalized to 1 CPU = 1000 SpecInt2000) – doubling the average numbers since 2009. This is really great news for the CHIPP community and CSCS sysadmins, and encourages all to continue with the good work. This is just one of many breakthroughs to come! We remember the Phoenix is a Grid Cluster run by CSCS for the Swiss Institute of Particle Physics (CHIPP). Phoenix has been upgraded early this year.